It's been said that a picture paints a thousand words, which is true. Here's the words that extend beyond one-thousand. 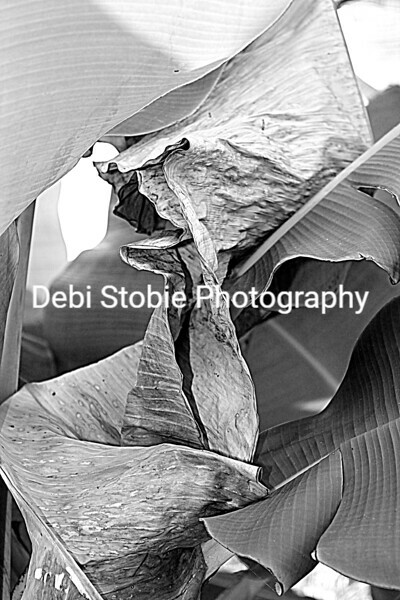 This black and white photo is a close up of banana leaves that I took while on a trip to Hawaii in November of 2013. I was intrigued by the textures on these leaves and my mind's eye immediately saw this image rendered in black and white to draw forced attention to these textures. It is a bit overwhelming to be in such a beautiful place and the natural instinct is to capture the iconic postcard images. I like to dig deeper though and find beauty that is often buried in the details and bring it to the forefront through a more intimate, up close look.